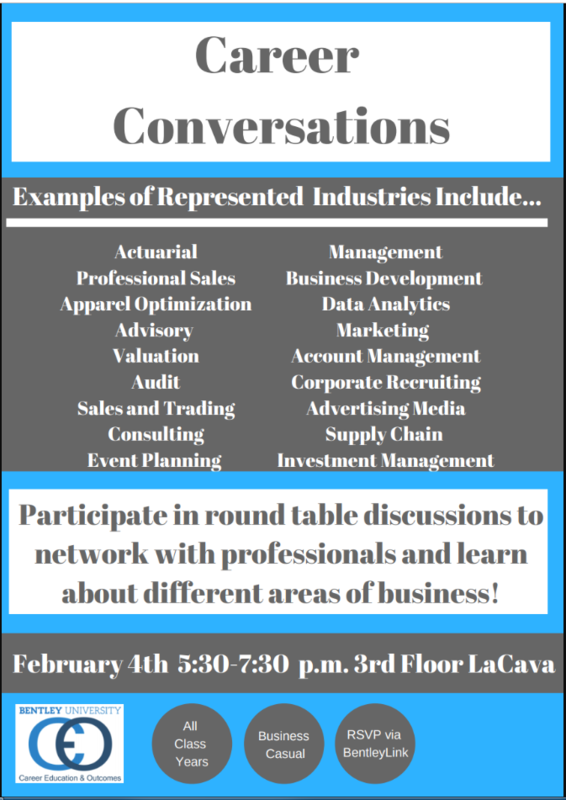 Attend Career Conversations on Feb 4th to Increase Your Consulting & Advisory Knowledge! Did you know that there is a great on-campus event coming up where you can hear first-hand from Consulting and Advisory professionals? Our annual Career Conversations event, being held on Monday, Feb 4th from 5:30 – 7:30pm is a can’t miss event for business students who want to learn more about the many career paths available to you as a Bentley student. Consulting and Advisory are just two of more than 30 areas that will be represented at this unique event. This is a round-table event where you can switch to a different table every 10 minutes, so you can come for a short period of time or stay for the entire event. The event will be located across multiple rooms on the 3rd floor of LaCava and both the Consulting and Advisory professionals will be in the LaCava EDR. Click here for more event details and don’t forget to RSVP on BentleyLink if you plan to attend!